A gangland drama, Eastern Promises delves into the shady and ultra-violent world of Russian mobsters overseas. In London, Russian mobster Soyka's throat is slit in a barber shop chair. Around the same time, young prostitute Tatiana dies in hospital, but gives birth to a baby girl. Nurse Anna Ivanovna (Naomi Watts), who is of Russian heritage but does know the language, is intrigued by Tatiana's diary, written in Russian, and containing a card for the Trans Siberian club in London. At the club Anna meets Semyon (Armin Mueller-Stahl), who appears to be an elderly restaurateur and food aficionado, but is really the London head of the Russian mafia. Semyon takes an exceptional interest in Tatiana's diary, and offers to translate it. His erratic son Kirill (Vincent Cassel) had ordered the Soyka hit, and Kirill's loyal driver Nikolai (Viggo Mortensen) does plenty of dirty work and is working his way into the family's trust. Anna soon realizes that she has unintentionally tangled with the dangerous underworld of cut-throat Russian criminals, Tatiana was one of their victims, and now Anna's family may be in grave danger. Directed by David Cronenberg and written by Steve Knight, Eastern Promises is a dark and moody crime thriller. Featuring abundant amounts of Cronenberg's signature gore, the film creates a foreboding corner of London where Russian mobsters run their own affairs according to old world rules, and the hierarchy of enforcers is denoted by elaborate symbolic tattoos stemming from the homeland prison system. Anna stumbles into this gutter and before she knows it Semyon, Kirill and Nikolai are circling her with various degrees of menace, smarm and lechery. Tatiana's diary contains information damaging to Semyon's enterprise, and Anna is thrust into the position of defending a cry for justice from the grave, as well as the future of an orphaned baby. Despite the intensity, Eastern Promises suffers from a lack of a central anchor. Most of the plot elements are instigated by a combination of Semyon, Kirill and Nikolai, and all three are presented as despicable gangsters. Anna is the one sympathetic character and most of the story unfolds through her eyes, but she is mostly an observer and a victim. The film features one plot twist, but it is not difficult to predict. More punchy is a memorable three-way knife fight to the death at a steam bath compound, Cronenberg in his element combining brutality, carnage and a refusal to greet death with anything except extreme resistance. 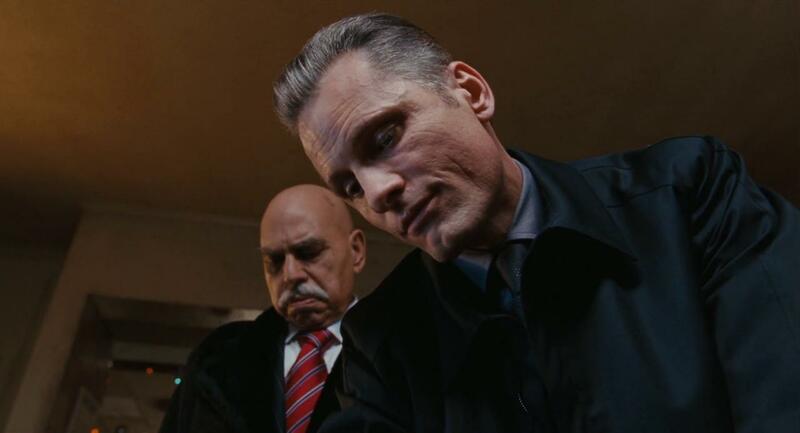 Mortensen re-teams with Cronenberg after 2005's A History Of Violence, and but has less to do in Eastern Promises, grim determination replacing simmering secrets. Naomi Watts echoes Maria Bello as the woman uncovering unwelcome mysteries. Vincent Cassel is suitably unsettling as the out-of-control and useless scion, while Armin Mueller-Stahl oozes unspoken intimidation from the smallest gestures. Eastern Promises is a bleak and gruesome story of cruelty festering in the corners of what appears to be civil society. Tatiana's diary reveals a young girl excited by hope for a better life. London is full of promise and opportunity, and old-school death.